A beautiful dainty maidens or ladies Claddagh ring made from 10 karat rose gold. This stunning Claddagh ring features two hands holding a heart topped with a crown. The hands stand for friendship, the heart stands for love and the crown stands for loyalty. This beautiful ring is the perfect gift for someone you love. 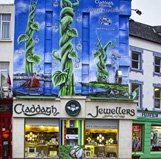 The romantic tale of the Claddagh Ring tells the story of Richard Joyce, a fisherman who was kidnapped by pirates and sold to a goldsmith. Upon his release from captivity, Richard returned to the Claddagh and presented the love of his life with the Claddagh ring. Today, the Claddagh design can be seen in many pieces of Irish jewellery but the Claddagh ring remains as the most popular choice for many when showing their love, loyalty and friendship to another.